These 40 lessons were designed to present a godly perspective of servant leadership and equip you to lead well. 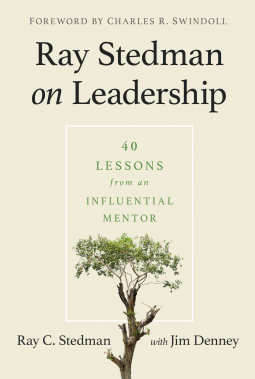 As a pastor, author and mentor to some of the 20th century's greatest leaders, Ray Stedman understood the pressures and privilege that come with leadership and uses his decades of experience to help you in your calling. Collected with your busy schedule in mind, each lesson takes about five minutes to read and the reflective questions will challenge you to put these lessons into practice in your area of influence. I love that this book has a collection of short stories and insights based on Christian values and living. Thanks Netgalley for the eARC, this book is well formatted in that the teachings/insights shared touch on various aspects of life, serving as an encouragement and sometimes calling for reflection. Ray Stedman had a definite gift for connecting people with the Scriptures. This collection of readings demonstrates that although he passed away in 1992, Ray’s words and works remain timeless. Each reading is followed by a series of questions to help the reader probe deeper into what leadership truly is and how it is best accomplished. The information presented will cause many to come away with a different way of looking at leadership. This book is excellent for individual and small group study.